A new national survey from Abacus Data released today in a presentation by Managing Partner Tim Powers at the Newfoundland and Labrador Employers' Council Conference, Newfoundland & Labrador is NOT an Island, finds that a majority of Canadians outside of Newfoundland and Labrador have a positive impression of Newfoundland and Labrador. The survey was conducted as a follow up to a similar survey of 995 Canadians conducted in May 2012. This year's edition of the survey also found that Canadians remain divided on whether the province is considered "a rising star in Canada", "an energy superpower", or a "great place to do business." Nationally, over half of Canadians surveyed (55%) said they had a very or mostly positive impression of Newfoundland and Labrador. Nearly, one in four (39%) said they had a neutral impression while only 6% said they had a negative impression of the province. Impressions were fairly consistent across Canada with Atlantic Canadians being most likely to have a positive impression (79%) while those living in Quebec (41%) and Alberta (54%) were less likely to have a positive impression of the province. "The history between Quebec and Newfoundland and Labrador is still there," said Tim Powers. "Quebecers don't hate Newfoundland and Labrador, but most don't love the province either. It's a complicated relationship." Now we will show you a list of statements that you might feel apply very well or very poorly to Newfoundland and Labrador. In each case, please tell us how well you think the statement applies to Newfoundland and Labrador, very well, somewhat well, only a little bit or not at all. Overall, do you have a positive or negative impression of Newfoundland and Labrador? When asked to write out three words that first come to mind when they think about Newfoundland and Labrador the most frequently mentioned words focused on the province's maritime economy (fishing, fisheries, and lobster) while others mentioned the province's geography and climate (words like beautiful, cold, ocean, island, and scenic). A number of respondents mentioned the province's oil reserves. Negative words included "remote", "poor", "far away". 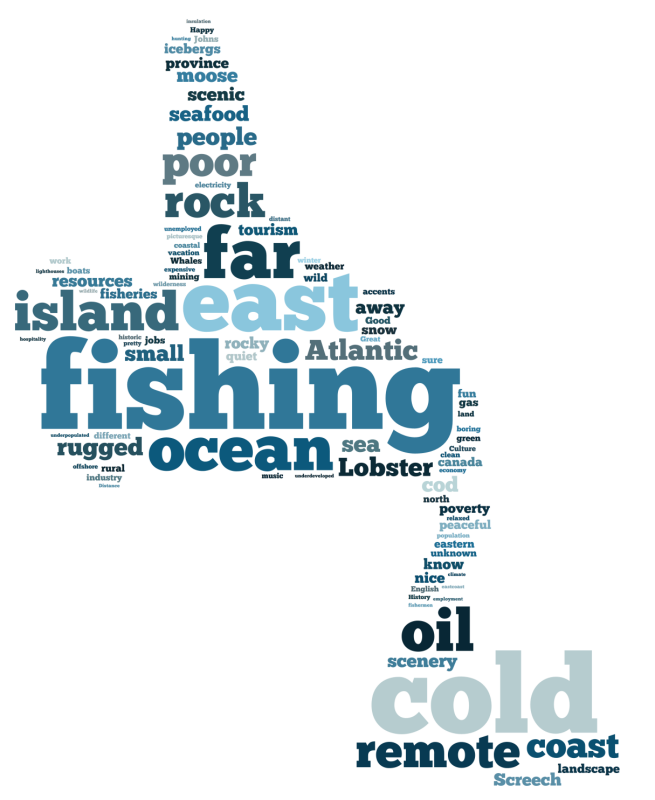 These remaining consistent with the common word used to describe Newfoundland and Labrador in the May 2012 survey. The word cloud below displays the results of the question with larger words being mentioned more frequently than smaller words. "While Newfoundland and Labrador is generally viewed positively, we still seem far away and inaccessible to many Canadians," said Tim Powers. "Our province needs to do a better job of selling the Newfoundland and Labrador economic success story, especially the major energy and resource projects in Labrador." How Would You Describe Newfoundland and Labrador? Respondents were also shown a series of statements and were asked how well each statement applies to the province. Overall, there was very little movement in perceptions about Newfoundland and Labrador in the rest of Canada. Canadians were slightly more likely to think the province is an energy super power while slightly less likely to think it is a great place to do business. "Newfoundland and Labrador's overall reputation across Canada has been stable over the past 12 months but there have been some noticeable shifts in its component parts " said Abacus Data CEO David Coletto. "It's position as an energy and resource superpower is well recognized, and almost half of Canadians still believe the province is a rising star in Canada. But there's still some work to be done in positioning the province as a good place to do business." "The province has a lot going for it. Cheap and plentiful electricity, valuable natural resources, and an industrious, hard working population," added Powers. "We just need to communicate those virtues to other parts of the country and around the world. Newfoundland and Labrador is a friendly and welcoming community that's open for business. " Overall, half of respondents believed that Newfoundland and Labrador is "a nice place to live and raise a family, remaining identical to the May 2012 results. There was less consensus when it came to Newfoundland and Labrador being an energy superpower (46% very well or somewhat well) which was up slightly (+2) from May 2012. Those who considered Newfoundland and Labrador as a rising star in Canada fell slightly (-2) from May 2012 to 48% (very well or somewhat well), and a great place to do business also fell slightly (-3 to 39% very well or somewhat well). The good news for the province's brand is that only 41% considered the Newfoundland and Labrador a "have-not province" but that has not changed much in either direction since May 2012. Information about the Newfoundland and Labrador Employers' Council Conference is available at: http://www.nlec.nf.ca/events/annual-conference/. To view the photo associated with this press release, please visit the following link: http://www.marketwire.com/library/20131112-ABACUS1L.png. About this company Abacus Data Inc. When you first think of Newfoundland and Labrador, what three words first come to mind? (Top 75 words mentioned) *The larger the word, the more frequently it was mentioned.